A Seattle-based renewable energy startup, Principle Power, has signed an agreement to build a deep-sea, 150-megawatt wind farm to be constructed on floating platforms off the Oregon coast. 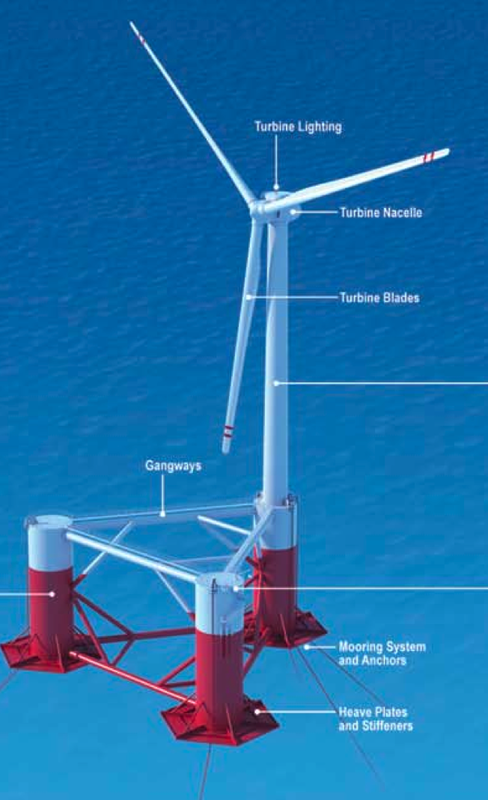 The deal with the Tillamook Intergovernmental Development Agency – which includes the local utility for a coastal county west of Portland – is very early stage but foreshadows two technological trends in the wind industry: massive megawatt turbines placed on deep-ocean platforms. 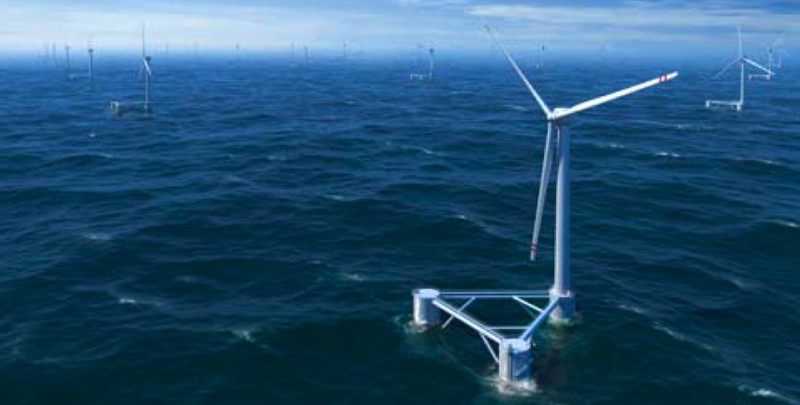 Principle Power co-founder Jon Bonanno tells Green Wombat that each floating platform – called a WindFloat – will feature a 5-megawatt turbine. By contrast, the biggest biggest land-based turbines are typically 2.5 megawatts, while General Electric (GE) makes a 3.6-megawatt turbine designed for offshore use. Beyond the technological challenges of supersizing a turbine, there’s the issue of how to get a 300-foot-tall windmill out to sea without breaking the bank. Various wind companies are tackling the problem but Principle Power’s solution is to license the WindFloat technology from a Berkeley, Calif.-based startup called Marine Innovation & Technology. The company’s founders, who previously worked on offshore platforms for the oil industry, designed the WindFloat to be semi-submersible. “The design and size of the WindFloat enables the overall structure to be assembled onshore and towed to its final location, significantly reducing construction costs,” according to Principle Power. “The WindFloat has undergone concept development validation through numerical modeling, third party engineering verification and extensive wave tank testing,” Bonanno said in an e-mail, noting that he expects a full-scale prototype to be built within a year. Depending on the permitting process and Principle’s ability to obtain project financing, Bonanno anticipates the wind farm to be up and operating between 2013 and 2015. Early estimates peg the cost of the wind farm at about $375 million. According to Ashby, the cost of laying a transmission line is about $1 million a mile. On the other hand, if the wind farm is too close to shore, residents will likely get riled up about the impact on their views. “We’ve already had an organized group come forward to express their concerns,” he says. Bonanno notes that if the wind farm was placed five miles off the coast, the turbines would appear to be the size of a thumb from the shore; at ten miles they would not be visible. I think wind energy is beautiful. I for one would welcome the turbines being visible from the shore. Do they have plans on how they are going to run submarine power cable 10 miles out to sea? Wing energy is great.. But Oregon has enough wind turbines on the ground as it is with more being built everyday.. with some areas becoming a real eye sore.. We already are having a problem dealing with the amount of power being produced with the turbines we already have in place. And I haven’t seen my power bill decrease yet.. If Califonia needs more power, first pay Oregon the several Billions of dollars in their past due electricity bills, and second find a place in your own state (perferable closer to mexico where we can’t see them ) to build more wind turbines… Wind turbines off the oregon coast, visible or not, “Absolutly Not”!!! High voltage DC power can be sent via power lines underneath sea water. such a distribution grid is already in development between Scandinavia, Germany, and the English isles. The future of electrical distribution is such High voltage DC transmission lines. AC distribution was the advent of Westinghouse back in the beginning to run 3 phase induction motors and its ease of step up step down transformers. However its major draw backs are distribution efficiency due to the alternating current interacting with its environment. As a world, we have a MAJOR infrastructure upgrade we need to do before alternative energy can really be a player. bottom line, super expensive and time consuming. Oregon has excellent offshore wind resources. California’s is much worse, especially in the south. The best in CA is off Eureka, and there are no good power trunks to there. Anyhow, just because the TPUD can’t use 150 megawatts doesn’t mean the rest of Oregon can’t. Let me start by saying I’m very in favor of wind, solar and other “alternate” energy sources. Now that’s out of the way…has anyone studies the ecological effects? Just curious what the impact of the wind farm would be on whale migrations patterns. This group needs to combine efforts with wave-energy power generation group toward designing an off shore application that harnesses both wind and wave in the same installation. As laying cable on the ocean shore – this is technology that began over 100years ago with telegraph cables across the Atlantic to connect US and Europe. A check of Ocean Navigation Chart shows five (5) transpacific cables alone coming ashore in the 80mile stretch of Oregon coast between the Columbia River and Pacific City, Oregon. Further, these installations would create excellent reef-like structure to support bait fish and others critical to salmon and ground fish population’s recovery. At 300ft high, these stations only need to 21miles offshore to be completely out of sight from shore and yet close enough not to pose a navigation hazard to 90% of the north/south shipping traffic. Finally, connecting these to the “grid” would be a non-issue as there are power sub-stations about every 12 miles along the Oregon coast according to Pat Ashby, the general manager of the 19,000-customer Tillamook People’s Utility District, in Tillamook, Oregon. The question is, can they net a return on their investment in a reasonable period of time to warrant the investment? High voltage DC transmission is not new technology now, it is already in place. In fact, China is putting in a ultra high voltage DC line that will be 1400 kilometers long (1000 miles) to feed some mining operations in remote locations. HVDC is being used in Europe, and even here in the US. It is a lot more efficient than AC transmission. Google HVDC transmission to get a some articles. In response to Annette’s very astute comment about operation & maintenance challenges in sea states that are less than favorable, we have studied these intensely. The WindFloat is designed to be easily towed, with regular tugs, to and from the site. This design function allows the site operator, in the case of Tillamook Principle Power, to do installation and maintenance at quayside in the safety of the deep-water harbor. By having the ability to tug these foundations with normal boats, costs are dramatically reduced by avoiding the use of expensive boats and reaching economies of scale. In addition, installation times are reduced, logistics simplified and service time expanded by not being as dependent on the good weather windows. Secondly, it is important to note that one of the core tenants of Principle Power is responsible environmental stewardship. To this ends, we are planning a deep review and through study of any environmental impacts and possible effects on the habitat by this installation. We are enlisting many local resources and stakeholders to create an open and positive consortium for this project. When the whales start paying my electric bills then they can have a say on how I get my power. You know the people that get so concerned about where our power comes from really don’t care, they just look for something to complain about. They offer no real solution if any at all but are quick to put down anyone else’s ideas. Of course you never hear these same people shutting off their electric connection completely. It’s interesting, I see plenty of these people going “green” but they do it in a way that is convinent for them. Ever seen someone cook their food over a fire, no wait that uses precious trees for resources. Bunch of hypocrits! Get out of the way and let true innovators work to find a way to harness the power around us so taht we ALL can prosper. TO THOSE OF YOU THAT COMPLAIN OR WORRY ABOUT VARIOUS “SIDE EFFECTS”OF WIND OR ANY OTHER NON-POLLUTING ENERGY SOURCE. CONSIDER THAT IF WE DON’T TRY THESE NEW THINGS AND CONTINUE USING FOSSIL FUELS, WE SHOULD EXPECT THE “MINOR SIDE EFFECT OF LOSING ALL OF THE COASTAL CITIES IN THE WORLD” DUE TO SEA LEVEL RISE, A CONSEQUENCE OF GLOBAL WARMING. IF YOU THINK IT MATTERS THAT WIND TOWERS OR THE APPEARANCE OF SOLAR COLECTORS ON YOUR NEIGHBOR’S ROOF SPOILS YOUR VIEW OF THE LOCAL SCENERY, YOU REALLY HAVE YOUR SELFISH PRIORITIES SCREWED UP! ON THE OTHER HAND, THE WHALES MIGHT ENJOY NEW MIGRATION ROUTES ACROSS SOUTH FLORIDA OR THE LA BASIN. SORRY FOR THE CAPS, I’M LOUSY TYPIST.